Hey, look, a ski race report. Another year, another trip to Marquette for the Noquemanon Ski Marathon. A super fun, point-to-point, net downhill marathon nordic ski race. Training has been going well this season once it really got rolling. 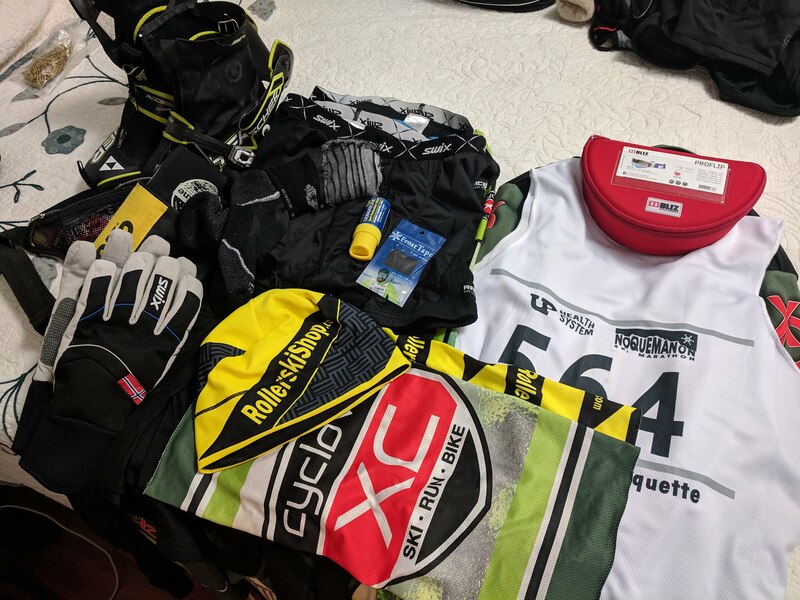 The end of mountain bike season should have translated directly into the start of ski training season, but that got a little delayed with a few weeks of broken thumbs. Once that firgured itself out though just a couple of rollerskis were had before the snow making loops in the area fired up and I’ve been on snow a lot. There has been less racing thus far with just the 17k PreLoppet and the 22k Rennet outside of the Wednesday night 5k races which I consider to be training not racing. I’ve been focusing on my two hard workouts each week plus a long weekend ski. The intervals have been ramping up later intentionally. I’ve got FAR more long skis in this year than last year. Prior to the Noq I’m was at 9 skis over 2.5 hours since November 1st. Last year I had 3 all season including the Birkie and Bear Chase. Lots of new snow this week and bitterly cold temps called for some cold skis and wax. Thinking the trail would be soft with the new snow I opted for my soft Fischer Carbonlites that have the super fine grind on them. In hindsight, the trail was actually pretty firm and the stiffer, but still cold flexed Rossignols may have been the better call. Wax was the Pioneer Midwest recommendation of Rex LF Black, Rex HF31, and then Rex TK-73 block underneath Rex TK-820 powder. From the sounds of it, more people went with straight Start MF10. For sure that would have been the cheaper call and probably better. Note that I actually took these skis out of storage and they still had storage wax on them. So the first thing I did was actually a layer of start green to just start the hardening process. I heard one person say they had fast skis. Everyone else talked about having the worst glide ever. I had to just laugh after putting my skis on and trying to skate a few strokes before the start. It was comically bad. Epically comically bad. Similar to two years ago at the Noq, the downhill start had me watching people whiz by left and right. So while everyone had bad skis, mine seemed to be sub par even for that. Later in the race I found myself thinking they were slightly slower than Jes and Nicolai’s skis. Not dramatically, but a little bit. OK, so it was cold. -15 at the start give or take. Fahrenhight. Not Celcius. -15F. Bottom was Swix Racex windbrief, extra buff, Swix Racex long undewear bottom, ski suit. Top was light Craft baselayer, Swix Racex long undewear, ski suit bib. A hat, two buffs, Bliz flip glasses, freeze tape, and Dermatone. New Swix thermal gloves. Toe warmers over the Fits socks, normal boots and no boot covers. I carried my drink belt with hot water in a flip top bottle and put a handwarmer at the bottom of the belt with the bottle upside down, and a second handwarmer stuck betwen the bottle and a can coozy. Water stayed liquid all the way to the finish. All the warm and windproof things. As mentioned prior, I got passed on the first downhill by quite a few people. The first major climb was a real grunt fest. Its steep and there was no glide to be found. I caught up to Artie and fell in behind him over the top. Most of the leaders were double poling in the tracks as skating was near imposible. I double poled behind Artie for about a kilometer before realizing I couldn’t keep that up for 50k. Once out of Al Quall there was some skating to be had though it was pretty herky jerky. Eventually we got a little group going that included Jes Pederson and Nikolai Anakin. To the best of my recollection Jes and I, and for the most part Nikolai never had anyone pass us until very late in the race. Jes and I worked together with a few people at various points. Jes was skiing well and would put some pretty hard efforts in at the front that gave me some worry. I was never apparently working too hard aerobically, as backed up by the HR data in the post race analysis, but the slow snow and jerky balance was giving me a real muscular workout and I felt pressed quite a bit. try and muscle a V1. Coming off the Dead River Storage Basin and heading up the climb to Granite Point, Jes and I had a little gap to Nikolai and one other skier dangling off the back on the lake. 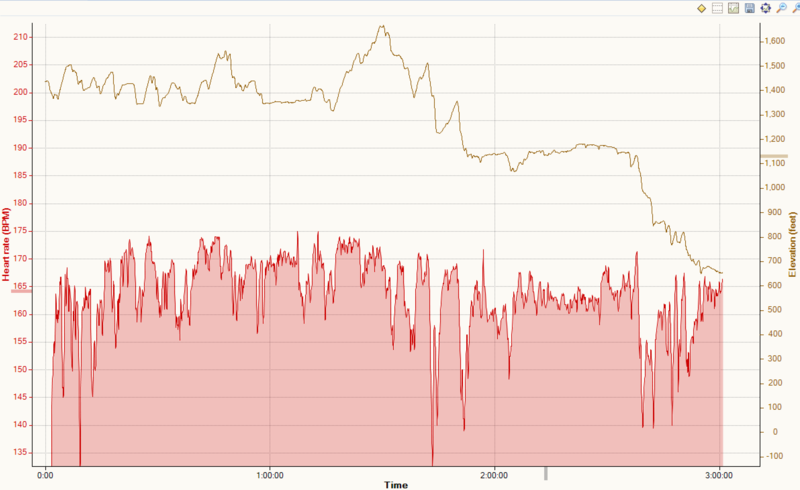 I was on the front and decided to set a good solid tempo up the climb. We had some semblance of glide at this point so a little up tempo V1 was keeping us moving. About half way up the climb I mentioned to Jes I thought we were getting close. I was wrong. That is a doozy of a climb. We never did shake Nikolai and he joined us on the descent down to 510. Jes was leading at that point and pushing the pace hard. Or it felt hard anyhow. HR and elevation graph to break up the wall of text. The climb into the Mead Highlands was tough. Jes continued to set a solid pace. There were a few mental doubts in this section, but I kept hanging. Eventually we were out into the Forestville trails where it was FUN last year. This year was not fun. No fast V2 skiing in here feeling like the strongest guy in the group. This year it was slogging V2 as if the flats were uphills. Eventually Nikolai was on the front, then Jes, then me. Jes pulled over and told me to not lose him. I again had doubts, but buckled down and got back on Nikolai’s skis. I managed to stay there for a few more km, but he kept ratcheting up the effort until I came unglued. In hindsight I was strating to cramp and I was a little bonky. I carried a couple of gels, but never ate them. I had about half to two thirds of my bottle of Tailwind, but we were 2.5 hours into the race at this point. With about 6k to go I lost Nikolai and then over the next few km I got passed I think twice more by skiers I hadn’t seen in a few hours. Jes was hanging just back there too not really losing any more time. Evetually the finish came and I was glad to be done in just over 3 hours. 30 minutes longer than it took the year before. I’m pretty sure I’m just as fit as last year, so a race taking 30 minutes (20%) longer than the year before is an indication of how hard the conditions were. In fact, the winner was 27 minutes slower. Tough day to be on skis. Subjectively I felt fine about my race. Not steller, not distraught. It was a tough day out there and I’m not sure I left it all out there given that my HR was surprisingly low. It was steady, but lower than usual. In fact, when sorting races by HR there is only one lower, the 2014 Birkie with the epic bonk. Another thing those races had in common was the length and tough conditions. Anyhow, the mitigation for apparently having left something on the table is not having just given up at any point. There was definitely some mental toughness needed to keep skiing. The lack of proper nutritional planning and not full on bonking is cool too. Mostly because that is easy to fix. Objectively, the Nordic Race Analysis Birkie Predictor says that this was a just outside the Elite Wave performance. Ther were only two elite wave finishers behind me and handful of guys ahead of me who had some stellar performances compared to last year’s Birkie. So, solid, but not amazing for me. FREEZING cold temps. Actually first we might get some snow in the Twin Cities. But then it is supposed to be a high of -14 or something dumb like that on Wednesday. This coming weekend is the City of Lakes Classic 42k on Saturday before I jet out of town for part of the following week to a place with even less snow than we currently have. So training is going to be tough for a week and a half. I need to be smart and persistent. Then 52k Vasaloppet, weekend off, then its the big dance.